The Barracuda 7 benefits from Beneteau’s vast experience in the development of specific hulls and is built on the latest generation of outboard motorboat hulls. Quick to plane and stable to drive, she is safe underway, but makes no concessions to sensations. 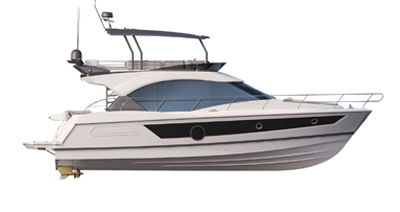 Still loyal to the strong design of this range, the Barracuda 7 has a straight pilothouse that looks particularly robust. The pilothouse has a 360° view and houses a driving station together with an extremely comfortable co-pilot’s seat. The two sliding doors open onto the port and starboard walkways, while the heads are located in the large completely closed stowage space, just below the pilot’s seat, which can be converted into a double berth. The light oak ambiance, and matching anthracite upholstery in the larger spaces, gives the boat a comfortable and cosy atmosphere. Whether for sport or leisure, fishing on the Barracuda 7 is a real pleasure, made easier by the numerous options uniting all the ingredients needed to customize her to match her captain’s identity. Drawing from the experience of the Barracuda Tours, the Barracuda 7 has fishing station unheard of on a boat in this category. Boasting modularity with a removable bench seat aft of the cockpit, she includes a live-bait well (supplied with regenerated seawater) offering ideal conditions for preserving live catches. In a fishing configuration, this really open space offers a pleasant seat to relax on, in addition to the two side benches and sliding bench. With an electronically controlled single engine between 150 and 200 hp and her new generation hull, the Barracuda 7 is stable and fast. Her 200-litre tank gives her great autonomy on fishing sites. Designed to ensure a good flow of movement between the pilothouse and fishing station, the 3-door version has a sliding three-leaf glass door. Geared more towards cruising, the pilothouse of the 2-door version is shut off by a bench that seats three people. Thirty or more options, including cutting-edge electronic equipment can be added to both the interior and exterior of each version. Boasting modularity with a removable bench seat aft of the cockpit. Le cockpit est modulable grâce à ses banquettes repliables.